—from Walking with the Great Apes. Three women in our time have invented a revolutionary way to conduct the science of primate ethology: dedicating their lives to a single species and living as close to the earth and trees as the great apes themselves. Jane Goodall, studying the chimpanzees of Gombe; Dian Fossey, living among the mountain gorillas of the Virunga volcanoes; and Birute Galdikas, chronicling the lives of Bornean orangutans—all three women used their relationships with their study animals as tools of inquiry, and the results astonished the world. This is a biography of the women, but also, more importantly, it is a biography of their relationships with the animals, and how those relationships changed the way we view the differences between human and non-human animals. 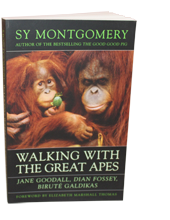 In researching Walking with the Great Apes, Montgomery walked the same earth as her heroines and, like them, has worked with the same apes in the wilds of Africa and Borneo. In recounting her own experiences along with those of the three brave women whose lives she evokes, she suggests what it is that their mentor, Louis Leakey, saw in them, and in the nature of women, that set Goodall, Fossey and Galdikas among the most celebrated scientists of our age. "This is a fascinating, shrewd, sensitive, thought-provoking book." −The New York Times Book Review. "A loving, deeply moving, often troubling book. Highly recommended." −Library Journal. "A spell-binding tribute. Few readers will be able to resist Montgomery's tale. Montgomery’s prose can be breathtaking." "A sensitive and revealing contribution to the legend of a unique scientific sisterhood." • A 1991 New York Times Notable Book of the Year. • The nonfiction winner of the 1991 New Hampshire Writers’ and Publishers’ Project. • A Finalist for the Los Angeles Times Science Book Prize for Science and Technology. • An American Library Association Booklist Starred Review. • A Library Guild Alternative Selection. • A Book of the Month Club Dividend.